Fighting For Alyssa (FFA) Charity Golf Tournament is held at the renowned Firestone Country Club golfing on the North Course! Join us for one of the finest golf and club experiences in the world! Kick back in their rocking chairs or take part in the tournament all benefiting the FFA mission! Fighting For Alyssa (FFA) is dedicated to the awareness, prevention, and treatment of substance use disorder in our communities. We are a 501c3 non- profit charity, tax id 81-4029124, affiliated with the Akron Community Foundation (ACF). Your contributions and support help FFA fund programs to fight this epidemic in our local communities. What We Do Over $100,000 has been donated to 17 local charities! And over $500,000 has been pledged out over the next 5 years to charities!! FFA provides funding to sponsor patient rooms, community rooms, sober living facilities and more! These contributions provide a safe haven for recovering addicts, resources to maintain a healthy lifestyle, peer support and job training!! 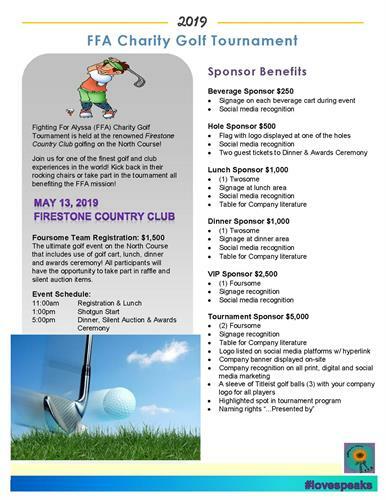 Our annual golf tournament, which is being held on May 13th, 2019, will raise funds and awareness that will benefit our mission and help us keep our promise to our communities!